For more about resilience in the face of rejection, check out Levy’s new blog here: The Rejection Survival Guide. Daniella Levy is a writer, poet, translator and self-defense instructor living in Israel. 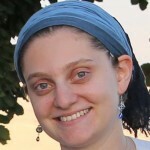 She blogs at LetterstoJosep.com about religion and life in Israel, and recently published a book based on the blog Letters to Josep: An Introduction to Judaism. She also blog’s about resilience in the face of rejection on her new blog RejectionSurvivalGuide.wordpress.com. Excellent read! Thanks for sharing your story. Beautiful words that reach out and reassure so many who feel the same way. Thanks for sharing a very personal story. This is lovely: honest and relevant. Art seems to be born of the wound. The wound, if we stay conscious of it, teaches us compassion and infuses the work. It also means the artist’s nerve-endings seem to be that much closer to the surface. My spouse, a brilliant writer herself, has put down the pen and moved into civic engagement. And is brilliant at it for much the same reason: the world’s uncaring-ness hurts. And so, yes, the imagined individuals, are creations of empathy. How could they not speak to you of hope? What a delight you’ve shared. “The imagined individuals, are creations of empathy. How could they not speak to you of hope?” You make a beautiful point. Thank you for your kind words. A great read that does give renewed hope. Thank you for sharing.